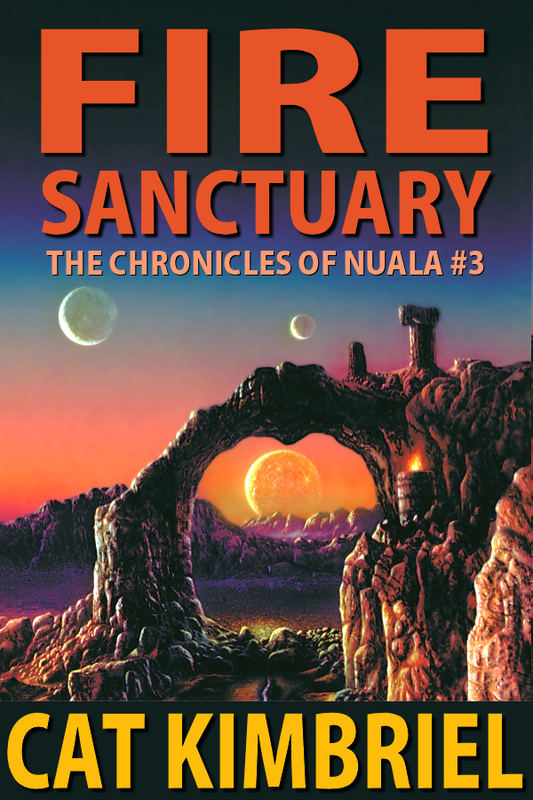 FIRE SANCTUARY, technically, is the third book in the Chronicles of Nuala by Katharine Eliska Kimbriel. (The first book in the series, THE FIRES OF NUALA, was reviewed here.) But it was the first released, and as it contains different characters and situations than THE FIRES OF NUALA or HIDDEN FIRES (to be reviewed soon), it can be read alone. If you’ve read THE FIRES OF NUALA, you already know how important the Atare are to the people of Nuala. The Atare are aristocrats of the first water, and are a fertile family made up of “20s” (the infertile, or people with borderline fertility, are called “80s”). Their leadership has been essential to the survival of Nuala. The main storyline of FIRE SANCTUARY deals with the interplay of five characters — Moran and Lyte, officers from the Axis worlds, Braan and Ronuviel (“Roe”) Atare, siblings and an important part of the Nualan aristocracy, and Teloa, a planter from Caprica. Perhaps Teloa’s story is the simplest, as she lands on Nuala and immediately claims sanctuary. As Nuala has been known for millenia as a planet that will welcome anyone, providing you are willing to be honest about who you are and who you’ve been, she is accepted with relative ease — especially as planters are valued highly on Nuala. Now, the main reason we have so many differing and important characters involved is this: there’s a war brewing, and Nuala may not be able to stay out of it. The Axis has been at war with the Fewha Empire for many years, and in this conflict, it’s possibly easiest to see the Fewhas as classic xenophobes, while the Axis is the old, corrupt empire that no one particularly wants to belong to, but everyone (save the Fewhas) has been forced to deal with anyway. Moran and Lyte have long been considered essential to the Axis, yet because times are changing — and because Moran has fallen in love with Roe — both Moran and Lyte have been ordered to Nuala. This is much more important than it seems, and not just because Moran and Lyte have major roles to play in FIRE SANCTUARY. You see, the Fewhas quickly attack Nuala and drive the Axis off. Nuala sustains a great deal of damage, with many people killed, even more crops destroyed and no real way of getting back at the Fewhas save by surviving long enough to outwait them. And because of the immediate attack, Braan, formerly a third son, and his sister Roe must assume power as the ruling Atare (Braan) and the Ragäree (Roe). This is no light thing, as what they actually now are happens to be the most important political leader and the most important, living symbol of fertility the Nualans have. Obviously, Braan and Roe will need all the help they can get. And Moran and Lyte’s help will be considerable. But don’t underestimate Teloa — she’s not only a planter, but has also been a “hustler” (what might be considered as a particularly high-end prostitute). She’s been forced to live by her wits due to a planetary disaster at Caprica, and because of that, she’s become an extremely quick study. Which is a good thing, because as Teloa finds out, Nuala is a tough place to live. As previously seen, Nuala is an extremely fragile planetary ecosystem. The radiation is what’s damaged so many people’s fertility over time, and it still needs to be accounted for in every facet of daily life. Planters like Teloa are valued because they must deal with the fact of the radiation along with everything else, and every available method — including sophisticated solutions from the Axis-aligned worlds and much easier, yet more intensive, methods such as crop rotation — must be applied or Nuala cannot feed its people. And it’s because Nuala is so fragile that a most unusual system of marriage has cropped up. The Atare have been bound by law to marry only off-worlders for years due to Nuala’s radiation and the need for off-world genes to add to the mix, and because of this, the Atare may take only one spouse as the people of Nuala have found, over time, that off-worlders do not take too well to polygamy or polygyny. Plus, there are extensive rules, lightly sketched by Ms. Kimbriel yet real, dealing with how the 20s may not take multiple spouses unless they do so from the 80s . . . and the upshot of all these rules is that the people of Nuala (Ms. Kimbriel never calls them “Nualans”) are both moral and flexible when it comes to dealing with human sexuality. The good part of this is that there literally are no illegitimate children. Like Marion Zimmer Bradley’s Darkover series, children are known by their mother’s name the vast majority of the time (only the aristocrats take a surname, it seems). And even when a father is acknowledged, his contact with the child he’s fathered seems largely up to the individual — something Ms. Kimbriel denotes by the attitudes of both Moran and Lyte as they acclimate to the society of Nuala. Most of FIRE SANCTUARY deals with how Nuala must adapt and survive now that the Axis has withdrawn from actively helping them keep the Fewhas off. Yet all of this action is underscored by the human relationships we see between Roe and her husband Moran, Braan’s growing attachment to Teloa, and Lyte’s various adventures. And that doesn’t even get into the important minor characters, including the remaining family of Roe and Braan, the high priest and priestess of Nuala, the other healers (Roe’s contemporaries), and the movers and shakers among both the Sinis (the radioactive people) and the Ciedärlien (nomadic tribes that live in what was once an inhospitable waste). Overall, FIRE SANCTUARY is an excellent novel, full of believable characters, interesting challenges, cross-cultural romance, and a goodly amount of action. As it was Ms. Kimbriel’s first-ever published novel, it’s not quite as good as her later FIRES OF NUALA — but that’s like saying an orange isn’t quite as good as an orange with chocolate sauce on it. Really, the only bad thing about FIRE SANCTUARY is this — it needs a sequel. Because I really want to find out how Braan, Roe, and the rest manage to keep the Fewhas off while staying alive to appreciate another day (or three). This entry was posted on April 7, 2013, 11:38 pm and is filed under Book Review. You can follow any responses to this entry through RSS 2.0. You can leave a response, or trackback from your own site. You and me both ^^.